Ah elegant Sophia! 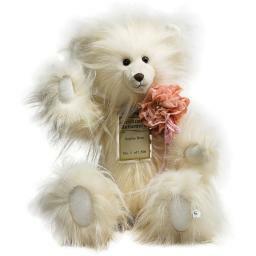 She is created from gorgeous white long-haired plush, with pure white velvety soft pads and ears. She has a thin long-pointed shaved muzzle with a small and neat triangular brown nose. She's wearing a delicate pink lacy corsage, finished with a trio of pearl beads. Aswith all the Silver Tag bears, Sophia is fully jointed, substantiallyweighted, and has a classic hump. Sophia comes with an individually numberedCertificate of Authenticity. She is 54 cm standing. Sophia is one of 1500. Shecan be spot cleaned.